Valves manufactured by IMI Remosa undergo the most stringent quality control. All welded joints are subjected to 100% radiographic examination where accessible to radiography, or to 100% ultrasonic examination where not accessible to radiography. Examinations are carried out in accordance with ASME Code Section VIII Division 1, Paragraphs UW-51 and UW-53 respectively. Furthermore, welded joints are also subjected to liquid penetrant examination in accordance with ASME Code, Section VIII, Division 1, Appendix 8, and to magnetic particle examination. All hard faced parts undergo a hardness test. After assembly, all valves undergo a hydrostatic test in accordance with ANSI/ASME B 31.3 Code and a hot stroking test which is planned and performed for every single valve simulating as close as possible the real operating conditions. 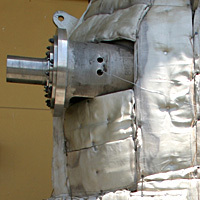 Hot stroking test can be carried out at the design temperature. drying-out/curing diagram for refractory material.